Reginald Fitz, MD, the visionary founding dean of the University of New Mexico School of Medicine and himself an internist, recruited a number of talented faculty in the early 1960s to create the school (view the HSC timeline). Included in this diverse group was the first Department of Medicine chairman, Solomon Papper, MD, whose arrival in September 1962 marked the “birth” of the department. Dr. Papper, a national figure in academic nephrology from the Medical College of Virginia, began the department with five full-time faculty and five support staff. The department was on the fifth floor of what was then the Bernalillo County Indian Hospital (BCIH), the school’s initial teaching institution. The 12 internal medicine housestaff were assigned not only to BCIH, but also to the Albuquerque VA Hospital, which became a Dean’s Committee hospital in 1964. Dr. Papper’s efforts established many of the essential elements of the department: a balanced commitment to patient care, clinical education and clinical research; a strong volunteer clinical faculty; the annual visiting professor program; and a summer research program for medical students. Dr. Papper helped create an innovative curriculum in which clinicians taught alongside basic scientists in the first two years of medical education. He also planned and initiated the third-year internal medicine clerkship and the subinternship in medicine for fourth-year students. By the time of Dr. Papper’s departure in 1968, there were 35 full-time faculty and 25 housestaff. To reflect a more significant role in the community, BCIH had become Bernalillo County Medical Center. In May 1969, Ralph C. Williams, Jr., MD, a rheumatologist and prominent immunologic investigator from the University of Minnesota, joined the school as the second chairman of the Department of Medicine. Dr. Williams was appointed by Robert Stone, MD., founding chairman of pathology who had succeeded Reginald Fitz as dean in 1968. Under Dr. Williams’ leadership over the next 18 years, a divisional organizational structure was firmly established, representing all major subspecialties and general medicine. Full-time faculty had almost doubled in number, the departmental budget exceeded $6 million, and research awards totaled almost $3 million. The department moved in 1975 from BCMC 5 North to expanded space on the seventh floor of the hospital’s new south wing. The Williams era saw major expansion of research activities, including the 1977 establishment of a National Institutes of Health-funded clinical research center. Patient care focused on specialized technical services in nephrology, gastroenterology, cardiology and pulmonary medicine. Outpatient visits and inpatient admissions increased dramatically at both UNM Hospital and the VA Hospital. In undergraduate education, the subspecialty division assumed much of the organ block teaching in the second year, and substantial revisions were made in the medicine clerkship. Postgraduate rotations were established at Lovelace Medical Center, St. Vincent Hospital in Santa Fe and Gallup Indian Medical Center, as well as subspecialty training programs at the fellowship level. In 1978, BCMC was leased by Bernalillo County to the state and became the University of New Mexico Hospital. In 1986-87, a new VA Medical Center clinical wing opened, allowing for more internal medicine faculty who also provide clinical service to Kirtland Air Force Base. In 1988, following a national search, Robert G. (Reg) Strickland, MD, was named the third chairman of the Department of Medicine. Dr. Strickland had served as chief of the department’s Division of Gastroenterology since 1972. The appointment was made by School of Medicine Dean Leonard Napolitano, PhD, who had served as the school’s third dean since 1973. A mission statement reemphasizing the central role of education in the department. 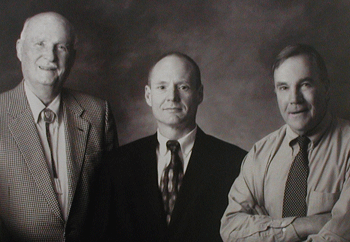 The department and Internal Medicine faculty played a central role in the initiation of a new Medical School curriculum in 1993. An enhanced working relationship with University Hospital administration and staff led to recruitment of new faculty through the New Provider Program. Expansion of the critical care service in internal medicine within University Hospital and recruitment of a Director within the Pulmonary Division. Appointment of the department’s (and School of Medicine’s) first endowed chair, the Flinn Chair in Adult Cardiology. Successful move of the Department from 7 south to expanded space on the 5th floor of the new ambulatory care center in 1991. The Department led the effort to plan the space utilization in its new home. Renewed emphasis on faculty development to successfully retain junior faculty; and to recruit more female faculty. By the year 2000 female faculty had increased from 5% to 30% and two of the Division Chief’s were female. The Department was also the first to initiate a new Faculty trac in the medical center – the clinician educator trac. A clinical trials center was opened in 1997. Located on 5 north, it successfully complemented the NIH funded GCRC on 5 east. Faculty, housestaff and administrative staff doubled over Strickland’s tenure as Chair and substantial increases occurred in clinical and research revenue to the department. Two new divisions were established – Geriatrics and Clinical Epidemiology/Preventive Medicine. The division of General Medicine was greatly expanded to meet increasing patient care demands and the department was the first to establish a hospitalist program at University Hospital and to staff the newly constructed offsite clinics. The Department responded to the initiation of more rigorous accreditation and resident training standards and was successful in completing 3 accreditation cycles during the 1988 – 2000 period. The department’s new location on the fifth floor of the University Hospital Ambulatory Care Center facilitated better integration of academic and hospital staff, and allowed for contemporary models of clinical practice as well as new programs in clinical education and clinical research focusing more on ambulatory activities. Pope L. Moseley, MD, the current Chair, was named to head the Department of Internal Medicine in 2001. Notes: The original text of this information is found on a plaque in the current Department of Internal Medicine lobby, and the portraits are also displayed in the department. Content has been edited for the Web.